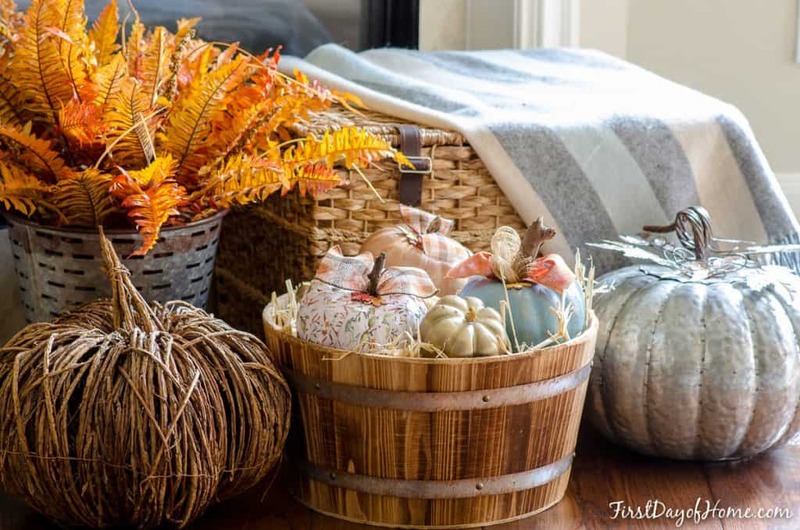 This season, two trends are dominating fall decor: velvet pumpkins and upcycled styrofoam pumpkins from the dollar store. I’ve put my First Day of Home spin on the dollar store pumpkin craze, too! 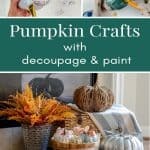 Today, I’ll show you exactly how to upcycle plain pumpkins with paint and decoupage. 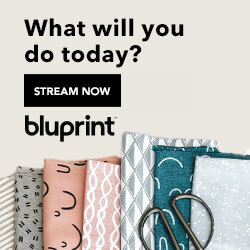 Now, let’s get started with these DIY projects! For this project, you’ll need just a few basic supplies. This is a great opportunity to reuse existing paint colors! Acrylic paints, chalk paint or latex paint in your desired color. I found that this chalk paint from FolkArt worked well as a primer coat. 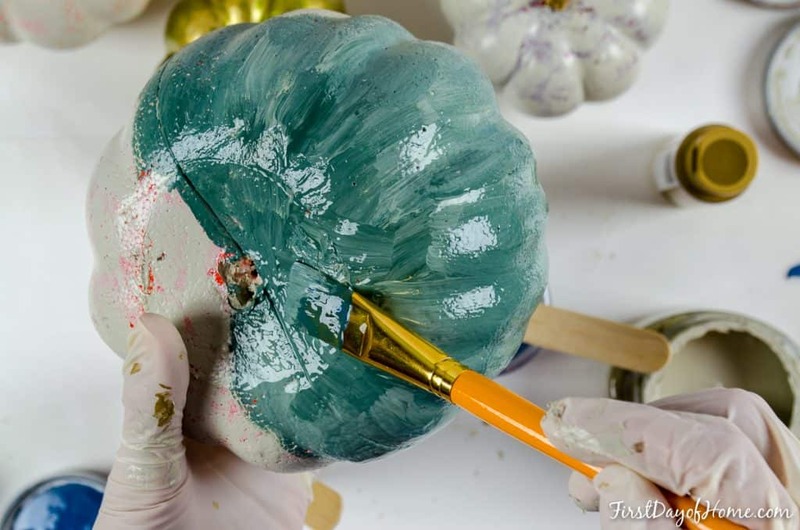 Before painting the pumpkins in your desired color, remove all foam stems. Then, apply 1-2 coats of thick chalk paint or another light-colored paint. This helps disguise the original orange color of the pumpkins. You can play with several colors to lighten or darken your paints until you find a tone that you like. 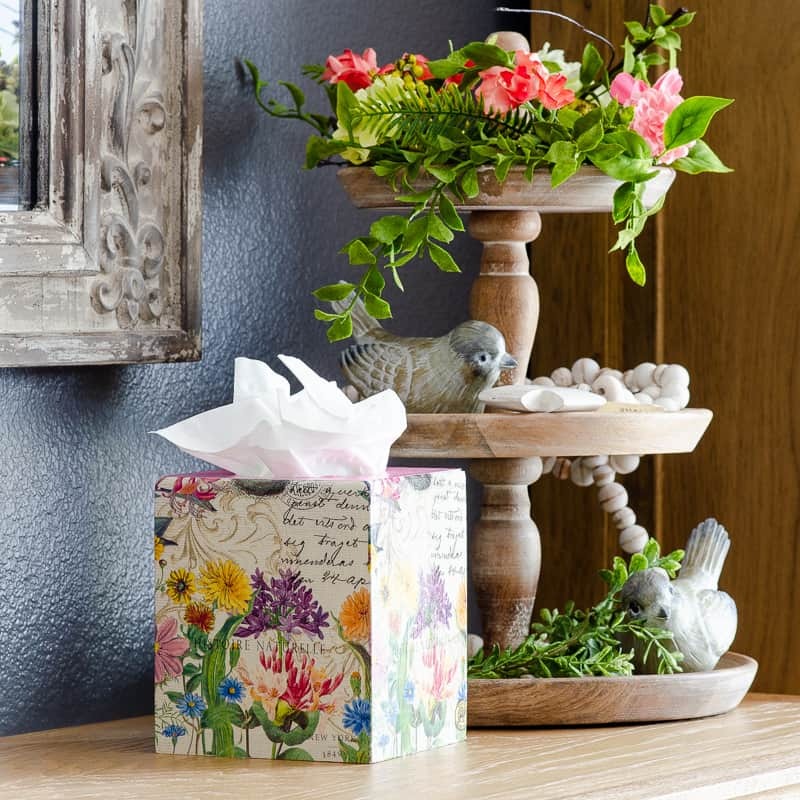 The chalk paint from the first step can also help lighten other colors as needed. I chose light teal and rust colors to coordinate with my living room decor. For best results, wait about two hours in between coats of paint. 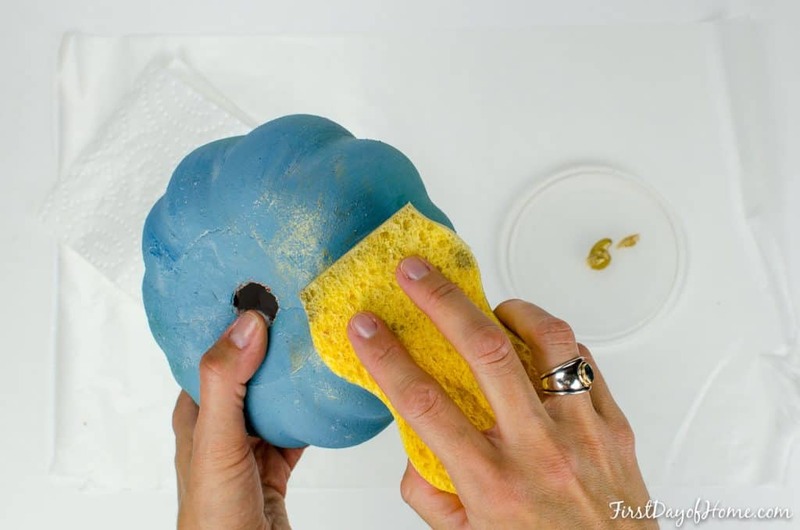 As a final touch, you can use a sponge or brush to apply accent paint onto the pumpkins. 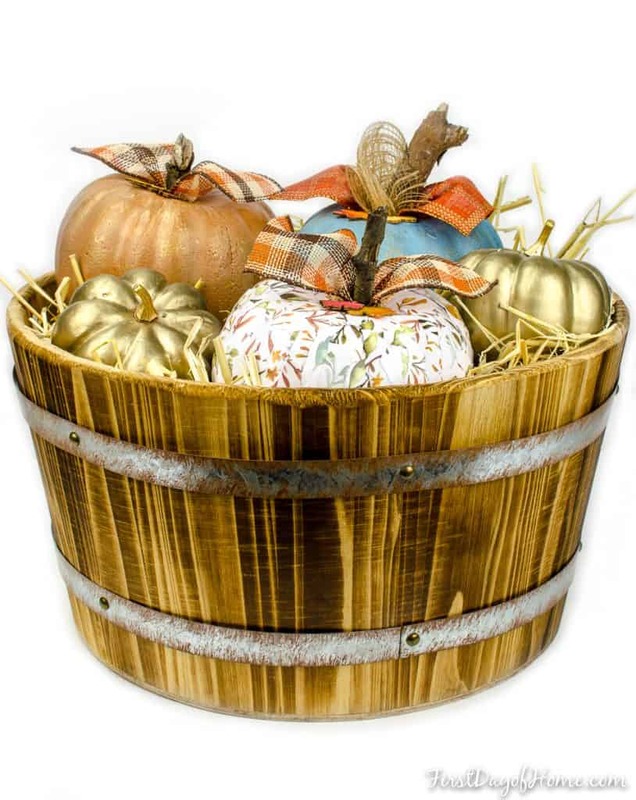 In my case, adding gold metallic paint gave the pumpkins more depth and texture. Since I decided to paint a few other dollar store gourds in gold paint, the collection hung together nicely. For stems, I collected twigs from our local community park. You can use any type of stem that strikes your fancy. 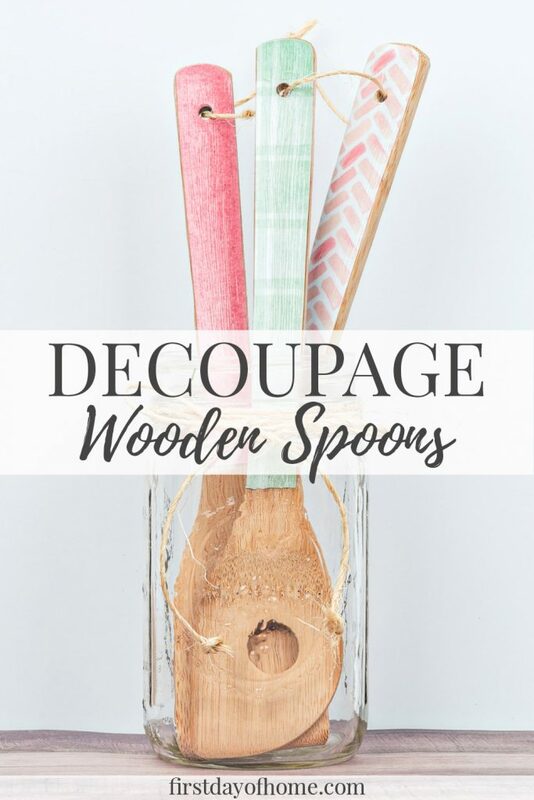 If you choose to use wooden stems, place the stems in the oven at a low temperature (200 degrees or so) to dry them out and get rid of any small critters. Once the stems are sufficiently toasted, you can gently insert them into your pumpkins. Did you know you can also keep real pumpkin stems for future craft projects? Just make sure you remove all raw pumpkin flesh, and store the stems in a dry place for several weeks. 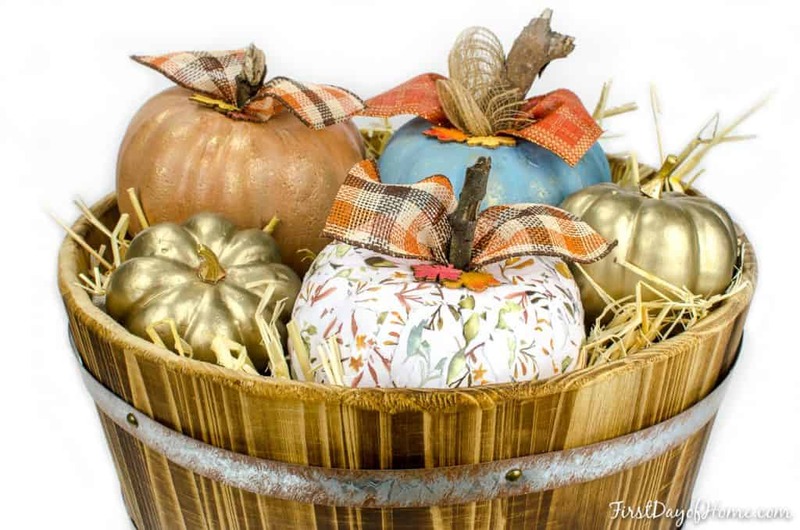 You’ll need only a few ingredients to make decoupage pumpkins. 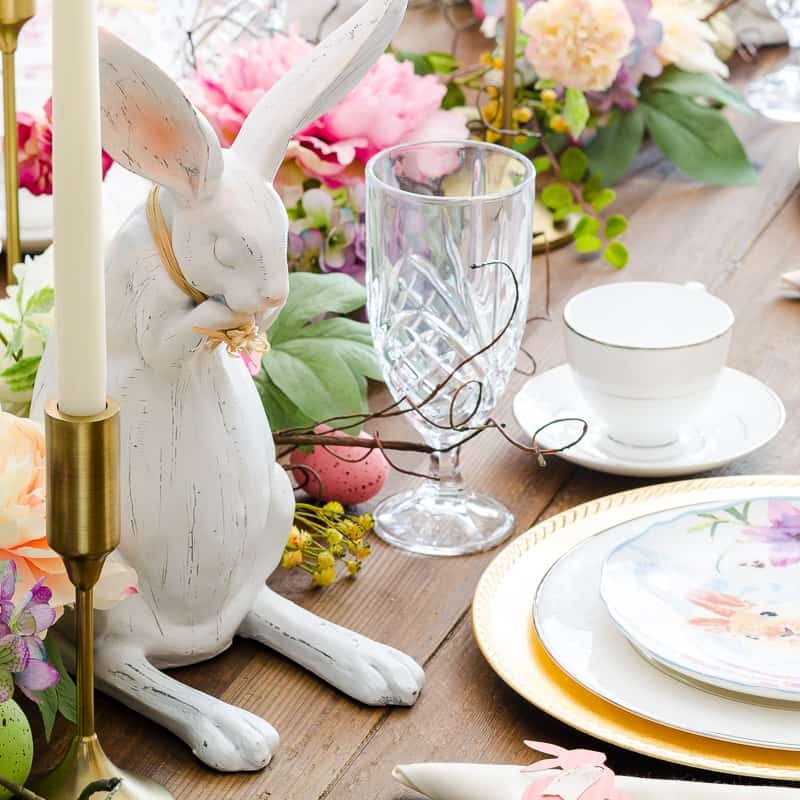 As always, feel free to add other adornments, like ribbon, beads or raffia, if desired. 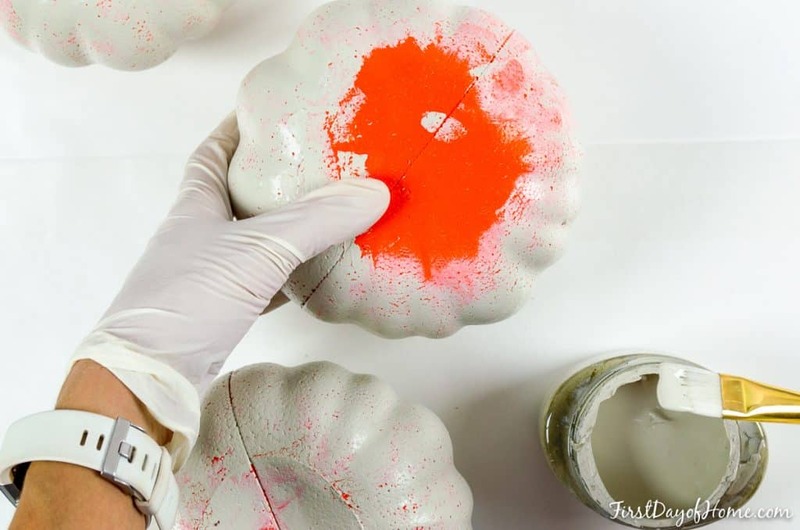 Before applying the first layer of Mod Podge, coat the foam pumpkin in paint, just like in step 1 above for the painted pumpkins. Create small strips of paper that will easily bend and curve around the foam pumpkins. The thicker the scrapbook paper, the smaller you will want your strips for the decoupage pumpkin. 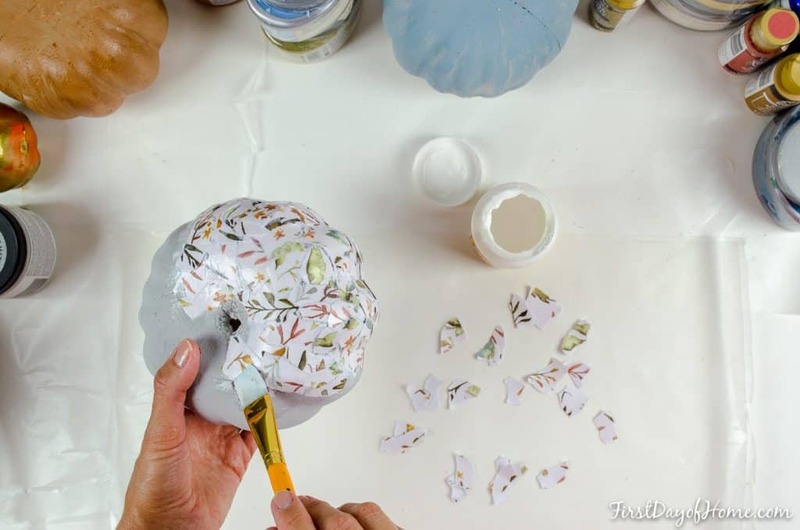 Apply Mod Podge to a small section of the painted pumpkin, and then place strips of paper to cover. After placing each strip, apply Mod Podge again to seal the strip in place. 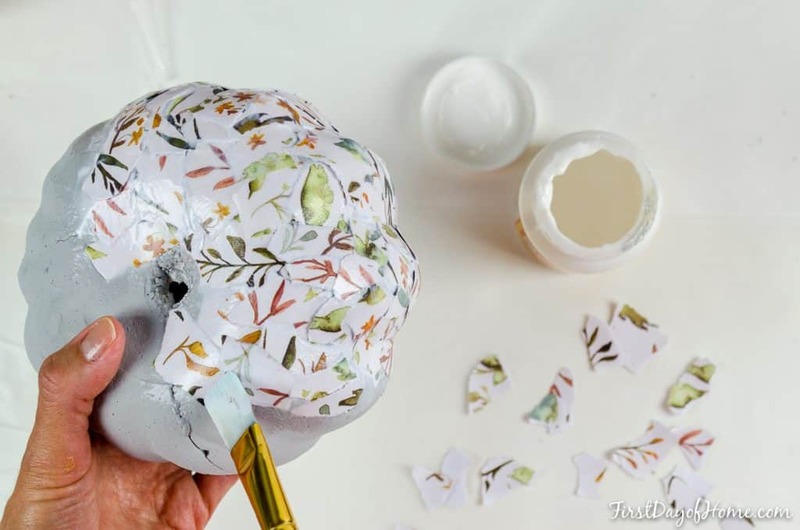 Continue to decoupage until you have covered half of the pumpkin. Then, allow the pumpkin to dry before continuing to decoupage the rest. You can add whatever bling you like to your upcycled pumpkins. I found an adorable set of mini wooden fall leaves that I placed at the base of my stems. 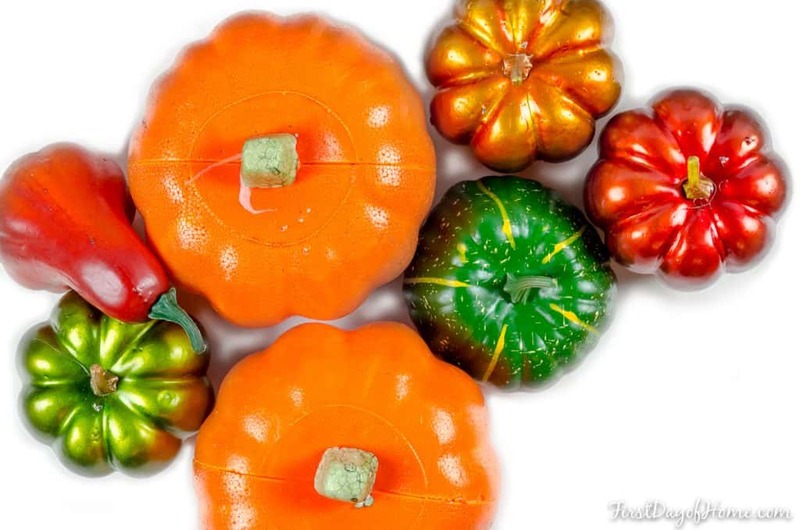 Try adding these to your Halloween decor next to jack-o’-lanterns or plain white pumpkins. 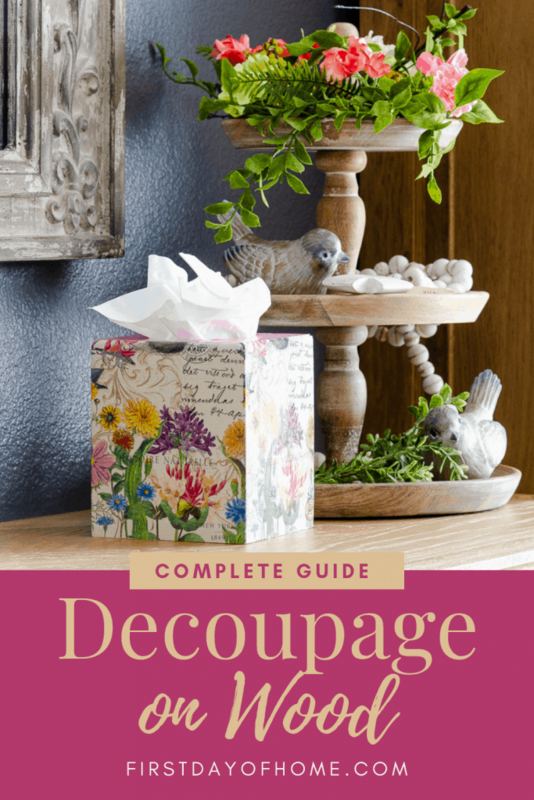 Looking for more decoupage projects? 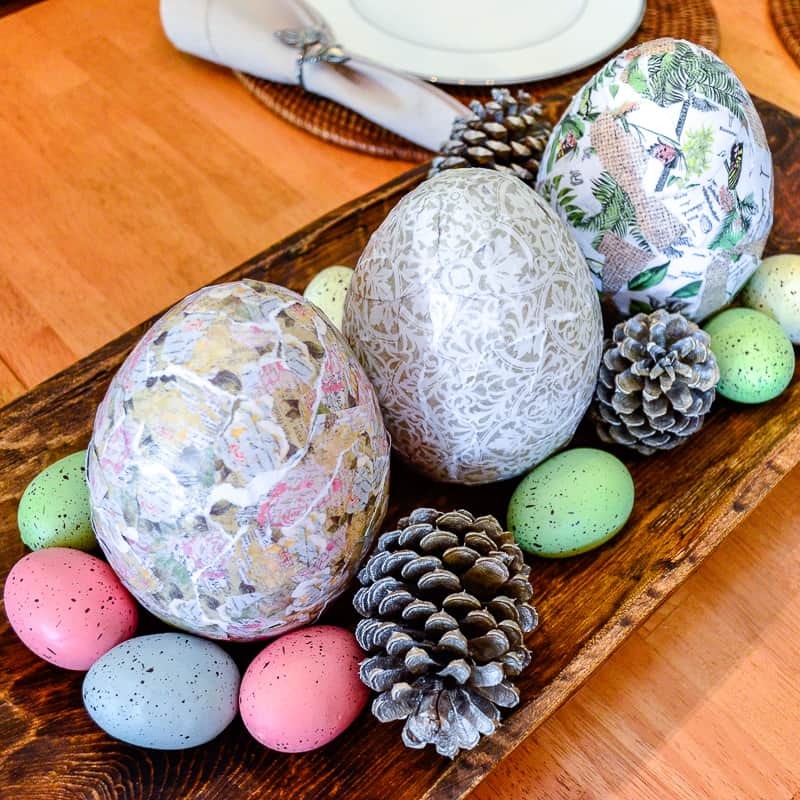 Check out my full tutorial for how to decoupage on wood! Here are a few more views of both the painted pumpkin and decoupage pumpkin on display by my fireplace. 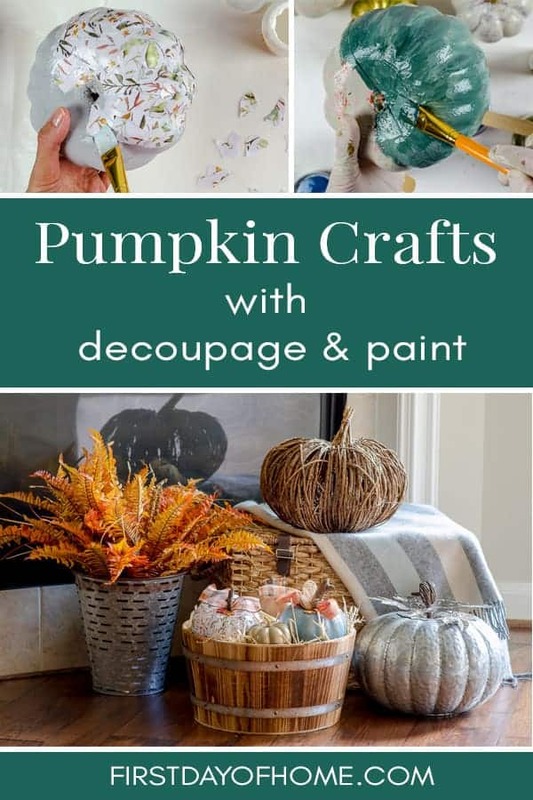 Do you have plans to upcycle some ugly pumpkins with paint or decoupage this year? Tell me about it in the comments below. These are adorable. They look amazing! Great tutorial. Great tutorial! Do you instructions on how you did the rafia covered one? 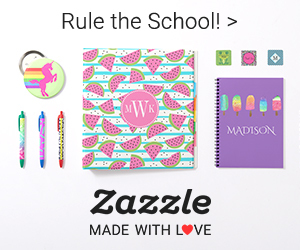 Did you just use glue or mod podge? Hi Renee! Thanks so much! I actually purchased the brown woven pumpkin at a local boutique. 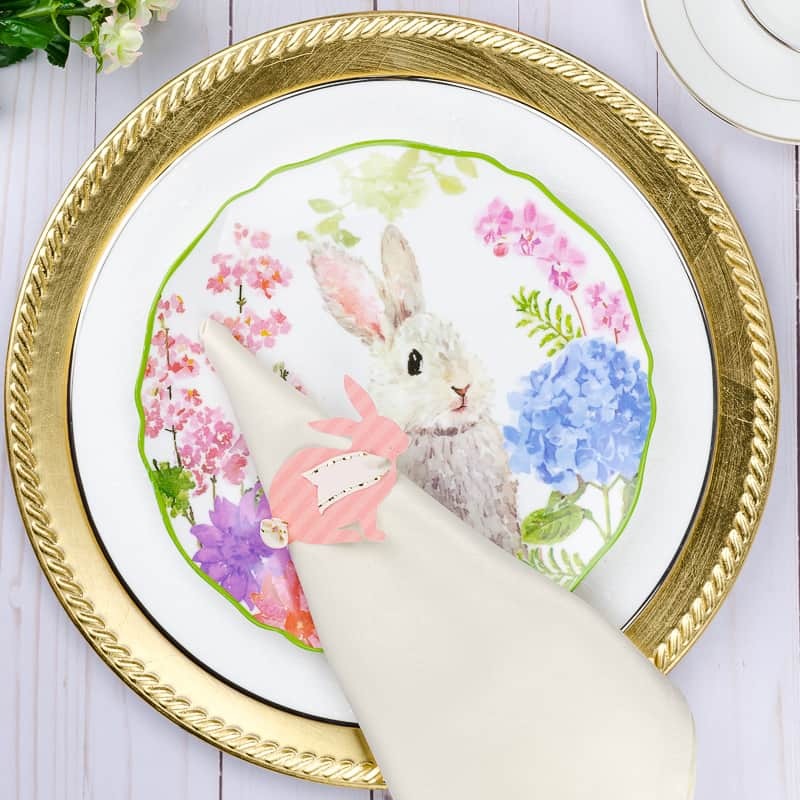 If I find a similar one online, I’ll add it to my home decor shop on this site! I love these and your display is awesome! Where did you get the planter pot that the pumpkins are in? Hi Oma! You’re so kind! I got the planter pot at Michaels. 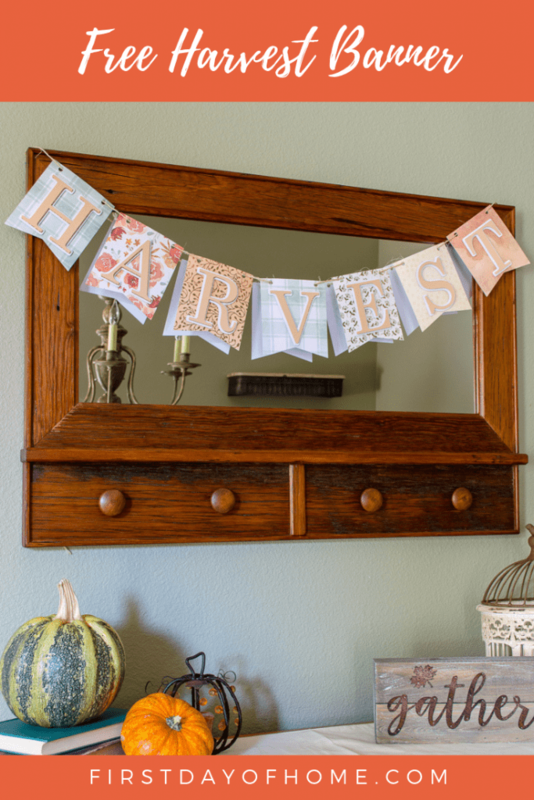 They had lots of cute farmhouse decor this year. You might also try Hobby Lobby. So petty, Crissy! You and I are on the same wavelength! 😉 Pinned! Hi Cindy! Thanks so much for pinning and sharing! I have so many projects I want to do and also struggle to find the time. Happy Fall! I love your pumpkins! Great tutorial! I have some pumpkins I painted blue last year that I would love to update. I think I’ll decoupage them now! Excellent tutorial and photographs. Pinned the title photo to DIY Rockstars, KariAnne Wood’s group board. Love these, they are so sweet! 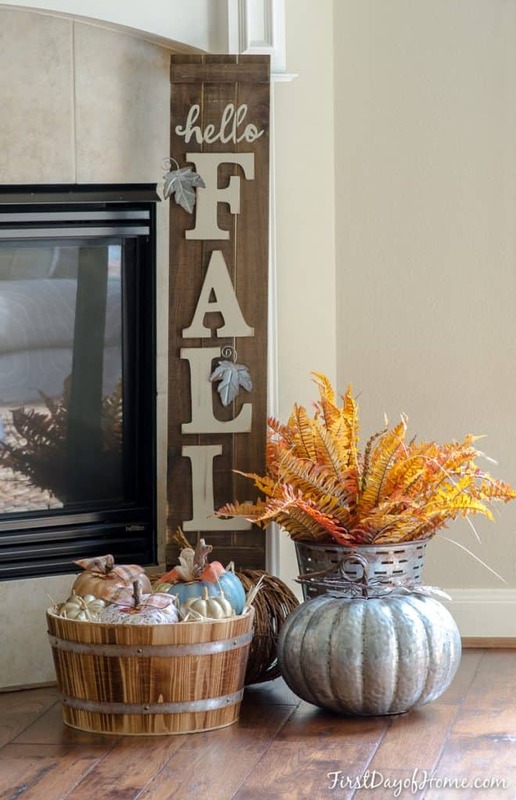 What a great way to turn not so fancy pumpkins into fall beauties. Can’t wait to try it! These are so cute!! I love the variety you ended up with! You’re always so kind, Stacey. Thank you! I painted a bushel load of plastic pumpkins last year and they’ve held up really well. Simply amazing!! Your pumpkin creations are delightful and so creative. Above all, the placement and decor in your home is magazine quality! Congratulations and keep up the good work.